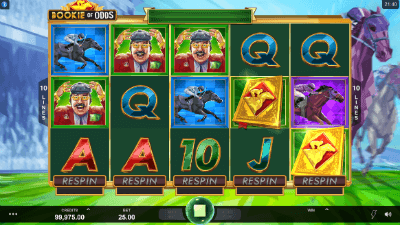 Bookie of Odds is another joint project of Microgaming and Triple Edge Studios with the horse racing. In reality, the virtual hippodrome of the online slot offers standard reel spins, which use a set of bonus features and a bonus. The famous racing festival started on the 14th of March in the English city of Cheltenham (Cheltenham Festival). The event, founded back in 1902, is held annually during four days in the middle of March. The main event of the festival is the Cheltenham Gold Cup, which this year was on March 17th. The second day is traditionally “ladies” (Ladies Day). Girls and women come to it not only from Cheltenham, but also from other British cities. Visitors to the festival try to choose the brightest and most unusual outfits, paying particular attention on headgear. This magnificent and colorful slot is dedicated to this famous and very traditional festival. The main page of the slot Bookie of Odds meets participants with pictures of characters, which includes jockeys, visitors and card values. Considering the functionality of the online slot, it’s logical that the list of titles includes a book. In this case, it contains the highest rates of payout, the replacement of all others and the activation of free spins. The slot has 5 × 3 reels, 10 paylines, additional purchase on each of the reels and is a continuation of the Book Of Oz slot! Replace any characters, as well as being Scatter symbols at the same time and launch the bonus game. 5 Wild symbols = 200x from the bet. After each spin, the player, by the desire, can scroll through any of the reels and thereby try to collect or improve the winning combination! It is also possible to get a bonus game in this way by purchasing 1 or more Wild symbols. The cost of additional purchase depends on the location of the symbols on the reels at the moment. It is worth noting that you can buy only 1 of the 3 missing Wild symbols, that is, you can no longer buy 4 or 5, because if the 3rd rolls out, the bonus game will start immediately. The Bookie of Odds is one of the few where users can play single reels. The practical benefit of the Single Reel Respin feature is that it is easier to collect expensive combinations, and the disadvantage is that you need to pay additional fees for this opportunity. The second feature of the slot looks much more familiar and is activated simultaneously with the Free spins draws. Here you select a symbol that in future free spins will serve as loose and fill in the entire diagonal. At the very beginning of the bonus game, one of the symbols is selected, which, if it falls out, will expand to the whole drum. Winnings from such symbols are awarded regardless of whether they fell out in a row or on unrelated drums. Effective tactics will help to complete the stakes in the Bookie of Odds slot with a positive result. The most important component will be the initial amount of monetary units, which should be enough for a long distance to justify the percentage return.